The Brunton GEO Pocket Transit is not only a compass, it combines a surveyor’s compass, prismatic compass, two inclinometers, hand level and a plumb into a single instrument. Brunton’s billeted aluminum, waterproof GEO Transit contains a fast, magnetic north seeking, rare-earth magnet, balanced on a sapphire jewel bearing for quick measurements. The most noticeable feature is the hinge inclinometer, accurate to ± 2º. This feature allows simultaneous trend and plunge measurements reducing the number of measurements you must take in the field. An innovative needle design can be locked or unlocked depending on your requirements. 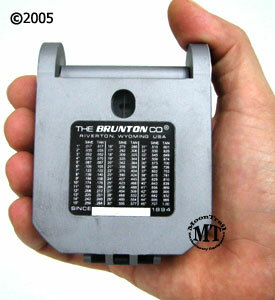 Image of Brunton GEO Transit in closed position, in hand. Adjustable needle locking mechanism with two positions: Unlocked – releases the needle for azimuth readings. Locked – momentary release of the needle for strike measurements by pressing and holding the release mechanism, then lock the needle for reading by releasing the mechanism. For accurate azimuth measurement, dip direction and trend measurements, center the bubble in the round level. The needle is attached to a rare earth magnet which is induction damped, which allows the needle to seek magnetic north and come to a complete rest in a minimum amount of time, without accuracy degradation. In combination with the needle, the 1° graduated circle allows for azimuth readings that are accurate to 1/2 degree. The long level for inclination measurement. For accurate inclination measurement, center the bubble in the long level using the vernier adjustment. Brunton has incorporated a cast NdFeB, rare-earth magnet which seeks magnetic north very quickly and allows for faster needle settling. The zero pin is the pointer used for magnetic declination adjustment. If no adjustment is necessary, the pin should point at 0° on the azimuth ring. The vernier is used for inclination measurements with an accuracy to 30 minutes. 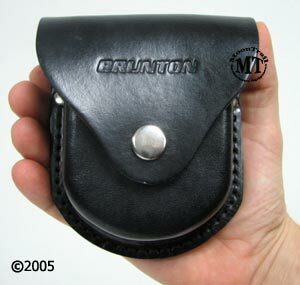 Attached to the cover, the small “buckhorn” style sight is used for precise bearing and inclination sighting. The large sight and the attached “buckhorn” style peep sight are used for precise azimuth measurement. Use the vernier adjustment to adjust the vernier and long level for inclination measurements. Adjust the needle locking lever to lock and unlock the needle. 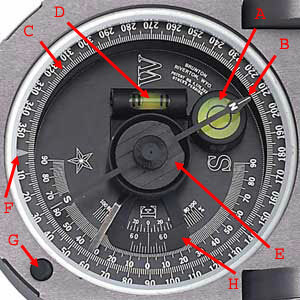 When it is not possible to view the round level, use side/bottom, long levels to level the GEO transit for azimuth and inclination measurement. Measure inclination using the lid and at least one of the three bubbles.